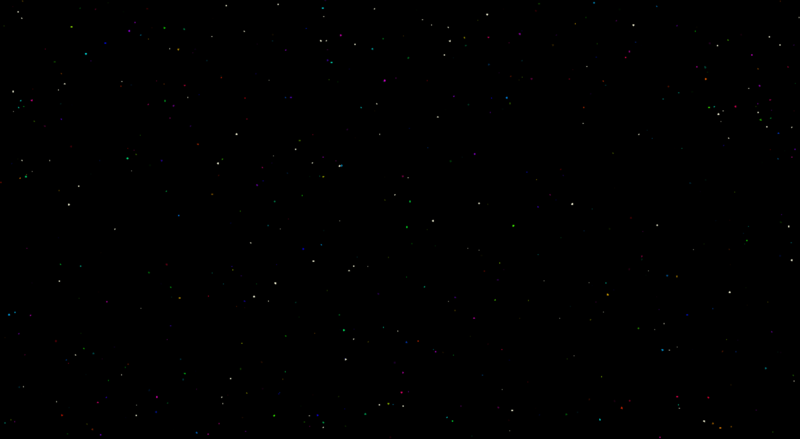 Note spinning 'Yo Yo' (above) in relationship to Moon in the above video clips. 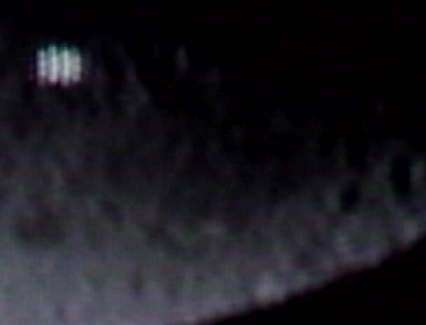 There is a massive line running from the moon behind this spinning object and much further out. There are also many other objects that are further out, some to seven miles. Just 'space junk'? Walled Circles Below are Similar to Ancient Celtic Circle Forts. 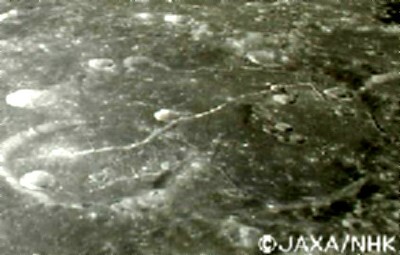 Japanese Salene-Kaguya explorer satellite provided High Definition video of the moon. JAXA (Japanese Space Agency) released a High Definition video showing 3D image around the moon's DYSON crater with road-like features. These are part of releases from the Salene probe that is currently in lunar orbit (2008). 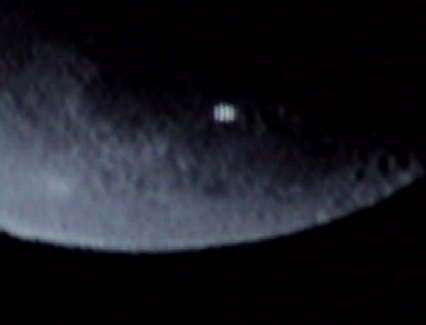 Observers using high powered telescopes have regularly captured large objects moving cross the moon. Astronomers have for decades reported seeing lights on the moon. Note long 'tube' running by discs, similar to below photo. Also note domed-roof structures cluttering landscape. Circles are drawn around metal disc objects in photos above. Note strange enclosure below with large 'bag-like' rim. Also note the long 'snake-shape-tube' running along right hand side, with one up against upper outside of bag-circle with 'chopped-off' bottom part of fin-tail-tube lying in 'destroyed' portion, upper-right area of baggy-tube. A shrimp-lke fin-tail also protrudes on inside of crater. Also note large domed object sitting on top of the lower bag rim. Space Object Suspended on a Cable? 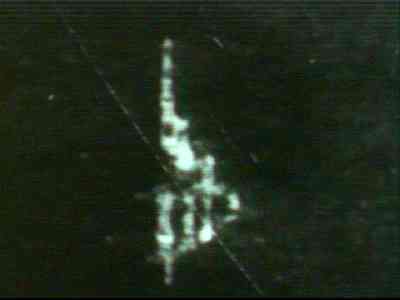 Oddly, there is a strange-shaped object one mile long, suspended on a cable 8.7 miles (14 kilometers) above the lunar surface in empty space. Too large to be recent space junk from earth, was it once some kind of spacecraft or satellite built by former, archaic inhabitants of the earth or the moon? Perhaps some legendary giants? The object appears to have several cylindrical units, a large conective unit, along with transparent and porous units. The object is so large it casts a shadow upon the lunar surface. 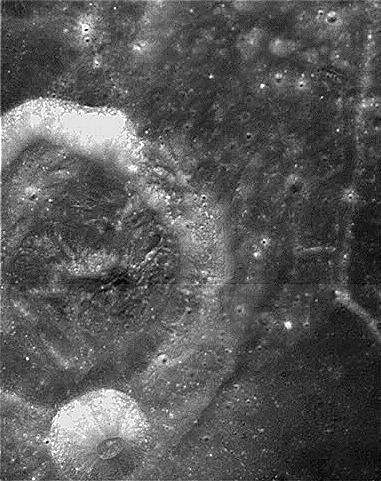 The above photo was taken by Apollo astronauts who named it 'Castle' (AS10-32-4822). There are others on the moon.